The next festive occasion is on the horizon - Easter and Easter egg time, However, I see that Cadbury's Creme Eggs are already in the shops, but they are just not the same anymore year after Cadbury announced they would be replacing the Dairy Milk in their recipe with a cheaper chocolate to make their iconic Eggs. Is that why the the company has suffered a loss of £6 million in sales? Apparently not according to US owner Mondelez who has insisted that the recipe change is not the reason for the dip in sales. And we believe this? If you haven't been discouraged by the recipe change, as I have, then the food press this week gave some weird and wonderful ways to try eating your Cadbury Creme Eggs. Which is for you? 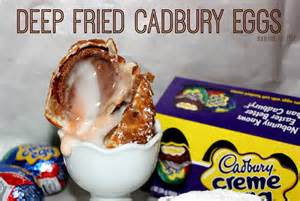 Considered something of a delicacy in Scotland, mush like the deep fried mars bar, but I gather Londoners acted with expected awe and mild disgust when a pop-up restaurant announced it would be serving deep fried everything - including Creme Eggs. Last year FryHard in Shoreditch sold wary Londoners deep fried Creme Eggs over the Christmas period and, according to the Daily Telegraph writer Harry Wallop (what a great name!) 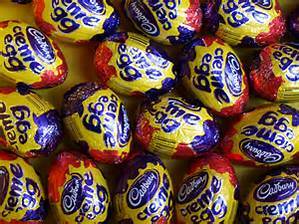 they're not that bad: "The Creme Egg is surprisingly good when battered. The confectionery has melted but remains entombed in its shell. Eating it is messy business, however. 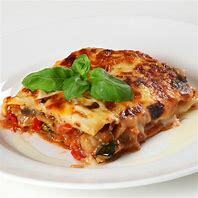 Once you bite, you shatter the fragile creation, causing an explosion of fat and sugar and you can feel your arteries clogging almost instantaneously." 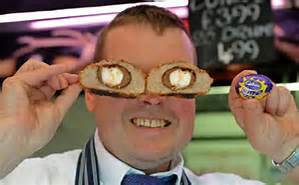 People aren't fond of change when it comes to Creme Eggs, but that didn't deter butcher Graham Eyes from playing mad scientist and creating the Scotch Creme Egg. Wrapped in sausage meat, coated in breadcrumbs and then flavoured with chilli and lime, the snack was created in an attempt to attract more customers. 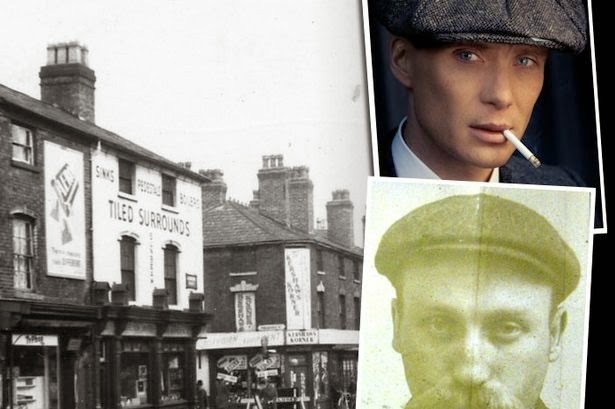 Eyes has admitted he's received mixed reactions from his customers regarding the dish: "Some of my customers can't wait to try them but other people think they just sound disgusting. Personally I think they are really tasty, I really like them. They've got a really interesting taste." This one isn't real but, for one horrifying half hour, Pizza Hut pranked the world and allowed us to believe their 'Creme Egg Stuffed Crust' pizza was a genuine product. 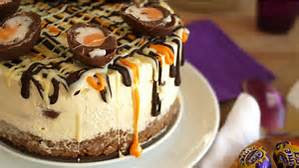 Capitalizing on the outrage from the change of the Creme Egg recipe last year, the Pizza Hut Delivery Twitter account jokingly posted an image of a pizza with the caption: "The original, the best - 2014 ' CremeEggGate'. 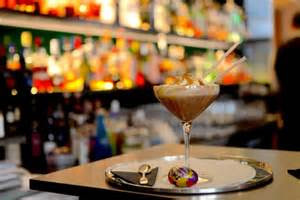 If cracking open your Creme Egg and slurping the goo out is something you enjoy, why not go the whole way and consider a Creme Egg Martini? Just what I fancy for a fun dessert. How do you like to eat your Cadbury's Creme Egg?